#stampinup #saleabration2016 When I saw the "Flowering Fields" stamp set in the Sale-a-Bration brochure, I knew that I'd have fun playing with the line-art flowers. Now, you know, I don't like to color, but these flowers only need a tiny bit of color--and they're easy to watercolor, which is what I did for this card. And this awesome set is FREE with a qualifying order during Sale-a-Bration!! 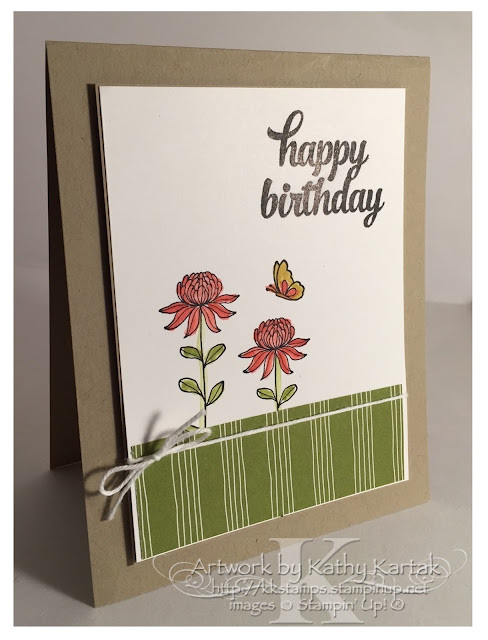 I CASEd a card I found on Pinterest made by Australian stamper Louise Sharp. Louise's card is square and she uses some washi tape and a different sentiment, but my design is basically copied from Louise! I stamped two of the flowers from the "Flowering Fields" stamp set in Basic Black Archival Ink onto a Thick Whisper White panel. I used Thick Whisper White because it "takes" water-coloring better than the regular Whisper White card stock. I used my Blender Pen to color my flowers in Watermelon Wonder, the leaves and stem in Old Olive, and the butterfly in Hello Honey and Watermelon Wonder. The sentiment is from the "Tin of Cards" stamp set and is also stamped in Basic Black Archival Ink. I added strip of Old Olive Wildflower Fields Designer Series Paper--another FREE item from the SAB brochure--at the bottom of my panel. I tied a length of Whisper White Baker's Twine at the bottom before adhering the piece to a Crumb Cake mat cut slightly larger than the Whisper White panel. I adhered this assembly to a Crumb Cake card base with Stampin' Dimensionals. I really like the way this card turned out--thanks to CASing Louise--but I have an idea for stepping it up just a tad. Stay tuned for tomorrow's card!